Garnering a reputation as Phuket’s five star beach, Surin attracts the rich and famous with its paradisaical white sand shores, aquamarine waters and high-end vacation rentals. There isn’t much travel attractions or activities in the area, which sits well with most Surin vacationers - most of whom are seeking a quiet getaway from it all. Live large in your ultra-luxe villa! Your Surin vacation rental comes with all the features you’d expect of a five star property - like impeccable service, immaculate decor and a full range of modern amenities. 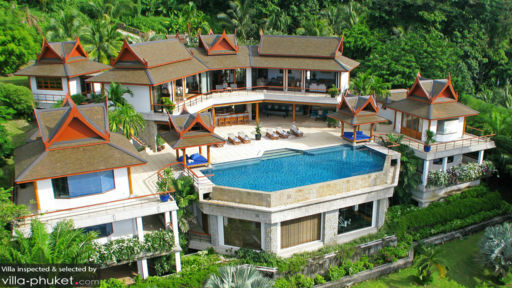 Most villas are set in prime hilltop or hillside locations, with uninterrupted vistas out to the sea. 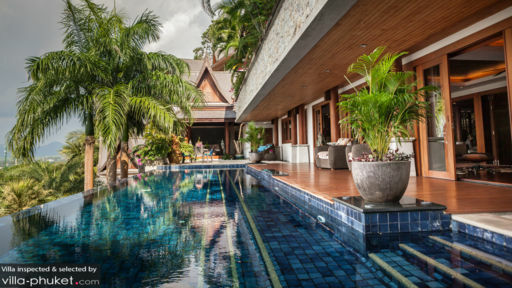 Each villa is stylish with modern design elements, yet retains a traditional Thai charm with accents like Thai-style roofs and oriental ornaments. With its clear waters and soft, white sand lined with casuarina trees, Surin Beach remains a hit with villa vacationers through the year. It’s great for taking a swim during the months of November till April, where the waters are calm. Strong waves are present from May to October, and while this is ideal for surfing, swimmers will need to exercise caution. Try snorkeling during the dry season (between October to April) around the headland at the northern end of the coast. There’s plenty to do away from the beach too. Try your hand at whipping up Thai delicacies in a cooking class at Twinpalms Phuket. Or release the stress and tension with a massage at top-notch spa centres like Palm Spa (at Twinpalms Phuket), Spa Sereniti (at Ayara Hilltops Boutique Resort and Spa) and Banyan Tree Spa Sanctuary. The spa centres are five to 15 minutes’ drive from your villa, but if you feel like staying in, your villa manager will readily assist with engaging a massage therapist for a private treatment. Add a dose of cultural sightseeing to your day with a visit to Wat Burapharam. When you’re not enjoying al fresco meals in your villa, you’ll be dining out at venues like Bocconcino Deli (Italian fare), DeDos LeLounge (French cuisine with an Asian twist), Oriental Spoon Grill & Bar (known for its magnificent Sunday brunches) and Silk Restaurant and Bar (Thai fare). Chill out with sundowners at a laidback hangout like Iguana Beach Day and Sunset Bar. For day trips, hop into a car for about an hour’s drive to notable attractions like Big Buddha, Radar Hill Viewpoint and Promthep Cape (a site known for its Instagram-worthy sunset shows). Pop by at Old Phuket Town to explore its charming streets, boutiques and Sino-Portugese houses. Located about 10 minutes’ drive from your villa is Phuket Fantasea, a family-friendly theme park with endless entertainment and dining options, as well as a nightly evening performance complete with traditional dances and stunning acrobatic acts. Revellers in search of a vibrant party scene will enjoy the glittering nightlife venues of Patong, about 25 minutes’ drive from your villa.